Stamp with Me: Bloomin' with Cold, oops Beauty!! Bloomin' with Cold, oops Beauty!! A couple of cards to show today! Sitting at your craft table on a cold wintery day is a warming thought. The sky was blue and beautiful but the temperature was very very chilly! It was so cold this morning that I saw frozen puddles everywhere on the way to work. I know Canberra gets especially cold in winter, but it was a bit of a shock to have it happen so quickly. It's only just winter!! Sorry, I am getting sidetracked! A favourite stamp set that was in the last Stampin' Up! Mini Catalogue last year was the 'Bloomin' with Beauty' set. This set is so classicly beautiful and so easy to use! I loved it last year and I loved it now. The only difference being I bought it last year and not this year. No difference!! I have stamped the image twice so that I could cut one layer out and adhere it over the first stamped image, using Stampin' Dimensionals to lift the image up! I have coloured in the rose itself with Rose Red & Certainly Celery ink with the assistance of the Blender Pens. You won't be able to see it properly in the photos, but I have then coated the flower head with lots of Crystal Effects. You should see how great it works! Just remember to give it lots of drying time! Of course, the card would work without the crystal effects if you were in a hurry, but if you've got the time, use it!! Inks: Stampin' Up! Classic Chocolate Chip, Certainly Celery & Rose Red. This second card, took a little bit more time as I made a window with this one. I framed the window with a paper-pierced border and adhered acetate (on the other side). The colouring of the flower is exactly the same however does not use Crystal Effects. A little bit of ribbon and bling, the card is done! 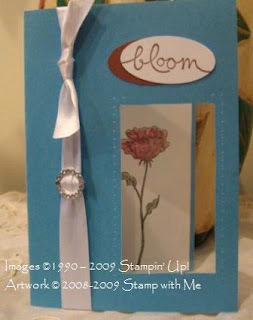 Use the Stampin' Up! 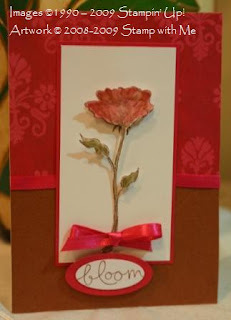 mat pack with this project as it's a great guide for paper-piercing the holes. In my personal opinion, these two cards show just how easily you can take one stamped image with an exact copy and make two completely different cards. Almost clever isn't it! Anyway, that's it for tonight. The heating must have switched over to overnight mode as I'm getting cold and my fingers are starting to type very badly (they're now ice blocks). A definite sign to call it a night and to go to bed. See you tomorrow. It's craft night!